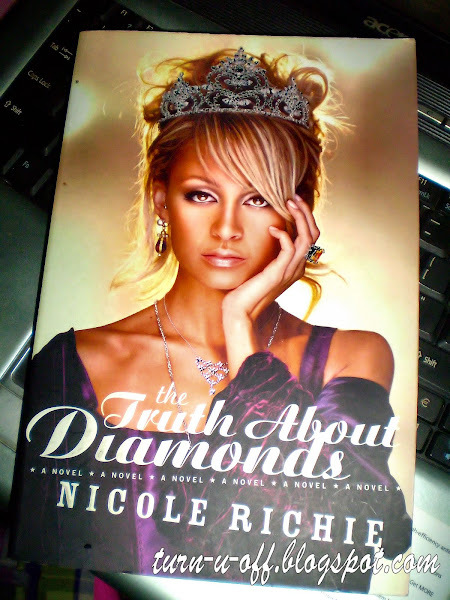 I bought this book recently and I'm not exactly sure what possessed me to buy it in the first place. Despite that, I find myself reading from page to page! But, I haven't finished it. When Chloe shoots to instant fame as a spokes model for a national ad campaign, her long-lost birth father appears out of nowhere and her best friend betrays her. She struggles to keep it all together - her sobriety, her friendships, and her integrity. Ultimately, Chloe comes spectacularly into her own, achieving stardom in her own right and finding true love. 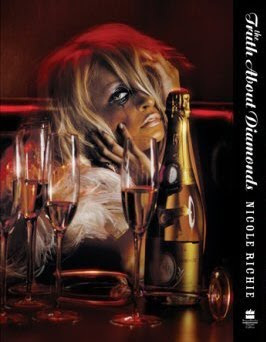 The book is filled with anecdotes and musings on rehab and the fickle nature of fame, but the surprising thing about it is how self-deprecatingly funny and enjoyable it is. 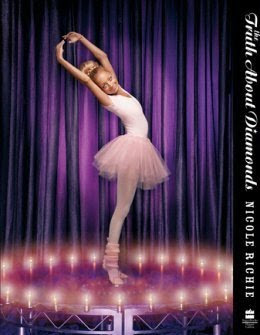 There are no deep thoughts in this book, or physiological point, just a fun read while I'm waiting for my nails to dry. This is a catchy song by Eminem featuring Rihanna and the video is amazing! I just love this hit video for the single "Love the Way You Lie" and it stars Megan Fox! The hot and sizzling Megan Fox and the Lost star, Dominic Monaghan play a couple that are in an abusive relationship and spent the majority of the video passionately kissing. Did you think the "Love the Way You Lie" clip was about Eminem and Rihanna? Whatever it is, I love the song. Happy Music Monday everyone! and I'm still alive. I haven't forgotten about you, my adorable blog readers. and I'm never too busy to pause and wish you all a very blessed Sunday!!! Thanks for stopping by and enjoy all your activities today! I am sure you all know who won the Miss Universe title this year. Well, the real entertainment will for sure come from the contestants. Each year new delegates give similar impressions upon the viewers. For all those reasons, they have made the Miss Universe pageant a good amusement. It was obvious that some of them were too nervous to talk during the interview. Pressure is one thing, but there is also another interesting fact that mostly happens to delegates who come from non-English speaking countries because they have to speak in English, which is not their mother tongue. The English native speakers of course could reply better without long pauses and err and the uhm we heard. Obviously, I can't feature all the videos of close-up interviews here, so here are the ladies from Asian countries who were competing in this year's pageant. Q1 - Being a woman, what piece of advice would you give to a man? Q2 - What is the best gift you have ever received? Q3 - What is the worst date you have ever been on? Q4 - Please make the following sound effects: lion, car starting, rocket launching, sheep, cow, and robot. Malaysia - Nadine Ann Thomas. Singapore - Tania Lim Kim Suan. Thailand - Fonthip Watcharatrakul who managed to win two titles (Miss Photogenic and Best in National Costume). Philippines - Venus Raj, the 4th Runner Up. China - Tang Wen. Hmmm... I could hardly understand what she was saying! Of course, the proficiency of the English language is not the gauge of getting the crown. They have passed a tough beauty contest in their own country to prove that they are worthy enough to join this one. So, do not dare to look down upon these young ladies! First, let me say, this blog post is long overdue! I honestly can't believe it took me ages to post this. Oh my, I'M SO SORRY about that and I hope you all can forgive me. Okay, no more procrastination (oh yes, I'm the queen of procrastination)! Peeps, congrats on your awards and THANK YOU VERY MUCH for passing them on to me. 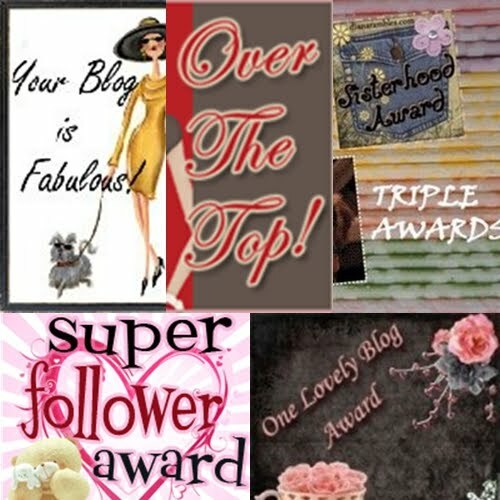 It is much appreciated and I am incredibly honored especially those from my new blog readers, it was totally unexpected and thanks for including me! You all seriously made my day. I eat out most of the time, almost everyday and I very rarely have issues dining out. I don't usually complain if there is a delay in the food order coming out of the kitchen or something does not come out the way I ordered it and I would never cause a fuss unless absolutely necessary. 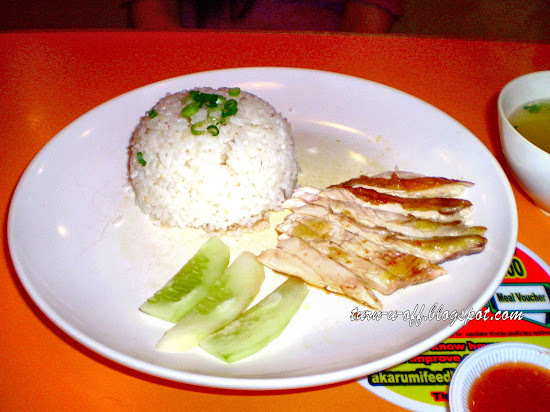 Last week, we had a really early dinner at Chicken Rice Corner @ Tropicana City Mall. 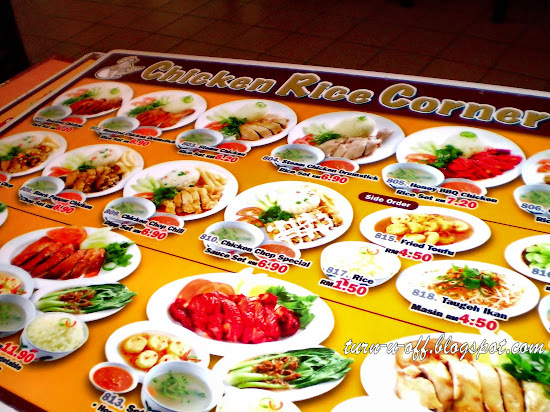 The pictures on the menu made my mouth watery and I ordered the Roasted Chicken Rice Set. 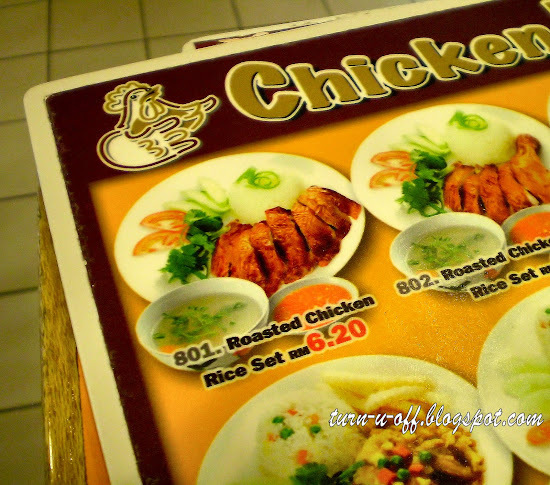 This is the Roasted Chicken Rice Set as advertised. And this was what I got! As you can see, the portion size was less than half of what was pictured! I was like, "Huh? The chicken looked as if it had been smashed!" Now picture it 50% smaller. Would you be a happy customer? 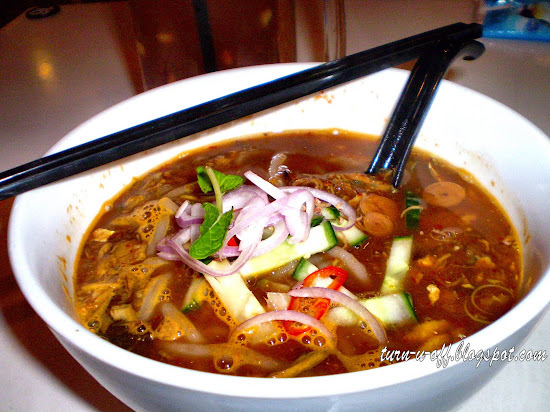 If you provide pictures of your dishes then they should be served as to what it is portrayed in the menu. Don't make false claims on the menu about portion sizes! If you want to reduce the size of the portions, decrease the price! I didn't take out my anger on the waiters. Sure, the waiters work at the same establishment and may represent the food too, but they didn't cook the meal. It's pretty easy to lay into a waiter. It's also not a nice thing to do. I already ate here, so it's almost too late. But it's never too late to not come back!!! Anyway, I will send the restaurant an email and let's see what the response is. All the while, I didn't know KL Sentral offers a huge selection of food. I thought there's only a McDonald's, a Subway, a Coffee Bean, and there's like million people pass through this place. Oh yeah, and there's a Burger King too. But I was really hungry, I need to eat rice! 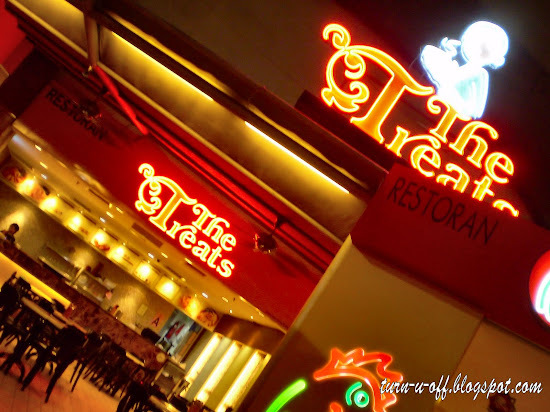 As we walked around, we came across The Treats restaurant. The restaurant was not crowded at all, which was perfect for us! 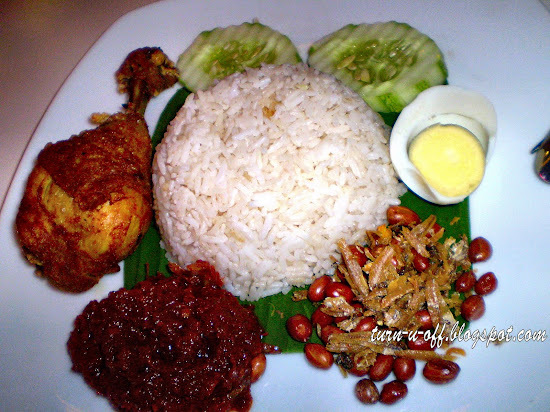 Nasi Lemak (rice cooked in coconut milk, accompanied with sambal, a chili paste mixed with salted anchovies) with fried chicken (RM 8.90). 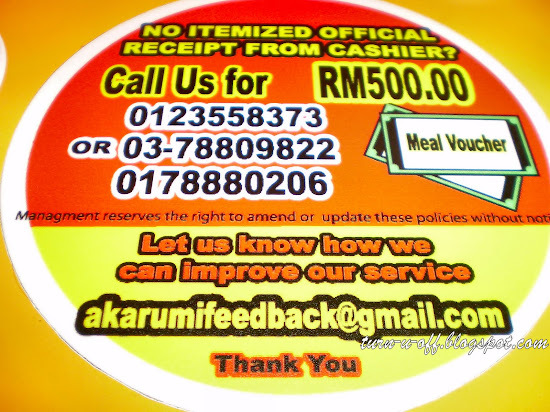 The Nasi Lemak is seriously awesome (especially the sambal) , so are the service and the place itself!